Across the globe the holiday season represents different things to different people. But what does a Catalan Christmas consist of? 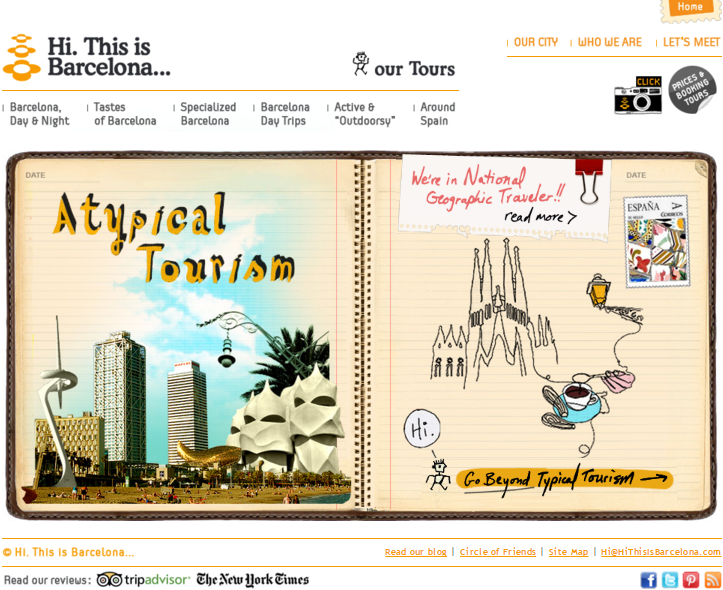 Here is our run down of what traditions and events are celebrated in Barcelona over the Christmas period. 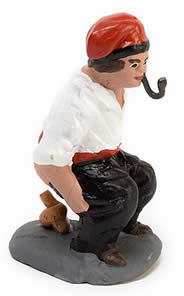 You would be forgiven for doing a double take when you see your first caganer (“crapper”), a figurine depicting a peasant in traditional garb normally tucked away at the back of a nativity scene. They are easy to spot given that they always will be found with their pants around their ankles, squatting over a freshly desposited poop(!). These cheeky characters have been regular inclusions in Catalan nativity scenes since the late 17th century, and in more recent years it is quite common to find caganars that have been crafted to resemble contemporary figures, such as Barack Obama or members of the British Royal Family. 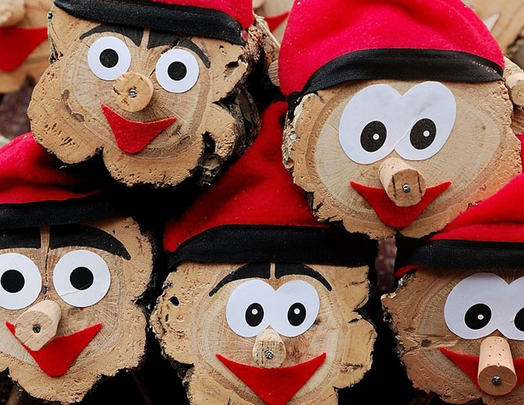 Continuing the the feces theme, Santa Llúcia is also the place to source your own Caga Tió (“Shitting Log”) – another staple of Catalan Christmas celebrations. The logs feature a cheerful face, a little red hat and a blanket. Tradition dictates that a Catalan households display their Caga Tió from December 8th onwards, and on a daily basis fattened it up by feeding it morsels of food. This process culminates on Christmas Eve, when the log is placed into the (unlit) fireplace and then repeatedly hit with a stick in order to make Caga Tió to emit its gifts, normally local candies such as turrones, much to the delight of any assembled children. December 24th: Christmas Eve (“La Nit de Nadal”). After gathering for dinner in the evening traditionally families will attend midnight mass (“missa del gall”). 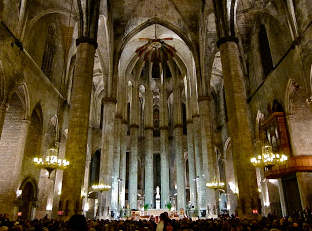 Across Catalunya congregations will be delighted with performances of “El Cant de la Sibil·la”, a Catalan Gregorian chant that is specifically performed on Christmas Eve – a piece that in 2010 was offically declared by UNESCO to be a “Masterpiece of the Oral and Intangible Heritage of Humanity”. If you’re planning on attending a service our recommendation is to head to the stunning Basillica of Santa Maria del Mar in the El Born district. December 25th: Christmas Day (“Nadal”). Yet more food is the order of the day on December 25th, which normally would consist of “Carn d’Olla”, a hearty one pot stew that has been slow cooked for hours. The broth of this stew is served as the entrée with the addition of pasta shells called “galets”. 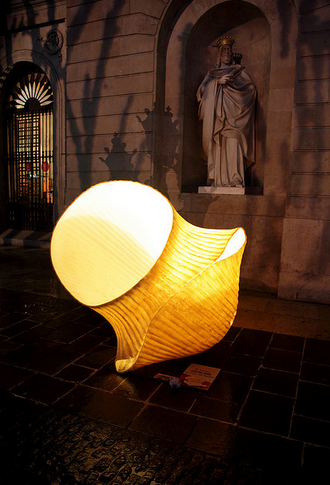 It is in honour of this tradition that you will find giant pasta shells dotted around the city, that are charmingly illuminated at night. For the the more adventerous local the main highlight of Christmas Day is participating in La Copa Nadal. 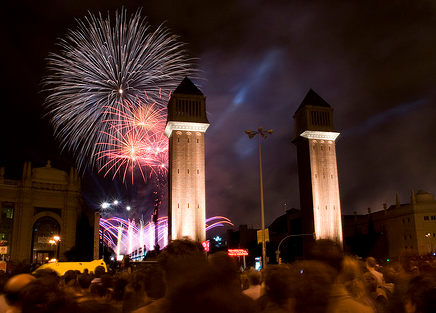 This annual event, organized by El Club Natació Barcelona, was first establised in 1907. 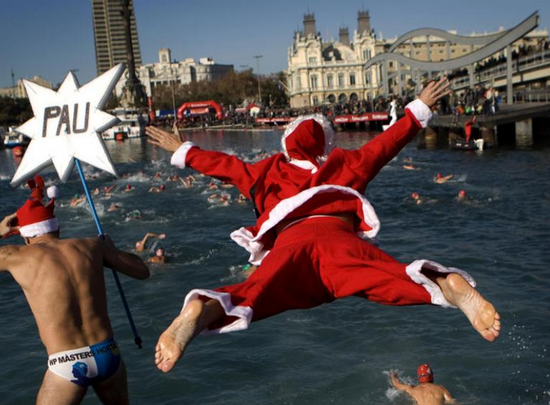 Partakers, often dressed in festive costumes, are required to swim for over 200 meters in the waters of Barcelona’s old port, just at the bottom of La Rambla. This event always draws a large crowd of well wishers and has an excellent party atmosphere. December 26th: St. Stephen’s Day (“Sant Esteve”). Unlike most of Spain, Catalunya does celebrate St. Stephen’s Day. And once again the main feature of this day is the food, with canelones taking centre stage. 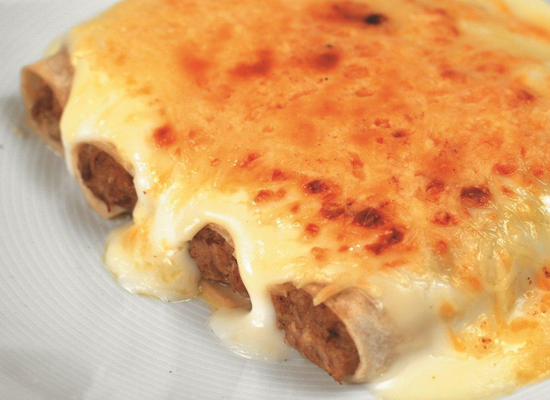 The Catalan variant, unlike their Italian cousins (cannelloni), tend to feature more creamy bechamel sauce, but less tomatoes. On December 26th theses pasta tubes are usually filled with the left overs from the large meals from the preceding days. December 28th: Day of Holy Innocents’ (“Dia dels Sants Innocents“). Celebrated throughout Spain, this is the day to take most things with a pinch of salt as it is the Spanish equivalent of April Fools’ Day. Everyone gets in on the act, from the youngest to the oldest and even the national media have been known to carry fictional news reports. 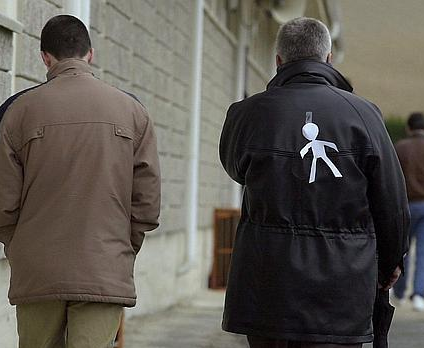 Keep your eyes open for unsuspecting members of the public strolling around the city with paper silhouettes stuck to their backs – one of the most classic pranks. December 31st: New Year’s Eve (“Nit de Cap d’Any”). In Spain it is traditional to go to a new year’s eve celebration armed with a bunch of grapes. With each chiming of the midnight bells you are suppose to eat a grape and make a wish. If by the final chime you have eaten twelve grapes then your wish is said to come true. From a practical point of view it is almost impossible to consume that many grapes in twelve seconds, but the process of trying is certainly very entertaining. January 6th: Feast of the Epiphany (“Dia de Reis”). This is the climax of the Christmas period and day most anticipated by Spanish children as it is the Three Kings (as opposed to Santa) who deliver their main Christmas gifts. Although the feast of the Epiphany, known simply as “Los Reyes”, occurs on January 6th in reality the main celebrations takes place January 5th. 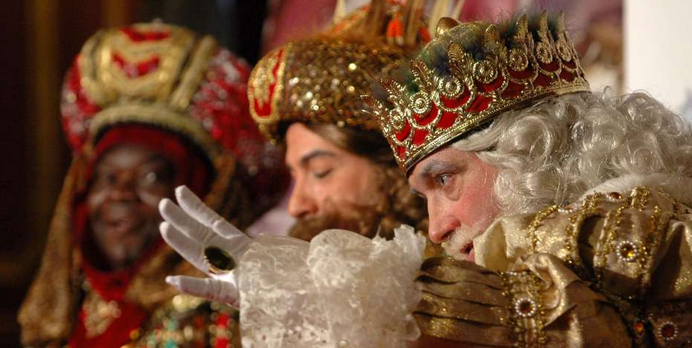 In Barcelona the three kings arrived by sea into the Old Port to be met by a very excitable and expectant crowd. The kings then go on a tour of the city, taking in an extensive route from Parc Cuitadella and ending by Plaça d’Espanya, before local children return home to see what the kings have left for them. All that remains on January 6th is for everyone to enjoy their final day of vacation before having to return to work or studies. Happy holidays from everyone at Hi. This is Barcelona! This entry was posted in Ancient celebrations, Barcelona and around, Barcelona Holidays, Catalan Celebrations, Catalan Traditions, Food and Drink and tagged April Fools’ Day, Barcelona, Caga Tió, Carn d’Olla, Catalan language, Christmas, Day of Holy Innocents’, Día de los Reyes Magos, Día de Santos Inocentes, December, El Cant de la Sibil·la, Feast of the Epiphany, Galets, Grapes, Inmaculada Concepción, La Copa Nadal, La Rambla Barcelona, Midnight Mass, Navidad, Noche Buena, Sant Esteve, Santa Llúcia, Santa Maria del Mar Barcelona, Spain, St Stephen’s Day, Tió de Nadal, UNESCO. Bookmark the permalink.